Fire has always been one of the greatest threats to homes; and wood one of the most common materials used for construction. In the US in 2015, there were 400,000 residential fires, causing thousands of deaths, injuries, and billions of dollars in damage and loss of property. Fortunately, the risk of fire can be reduced and the damage in case of fire minimized by applying fire retardant paint for wood (aka flame retardant paint for wood) and other fire rated paints suitable for wood and timber. Allows the fire fighters more time to arrive and get the fire under control. In this article we will take a look at the further benefits and technology of fire rated paint for wood as well as providing an overview of DIY products and professional contractors specialized in fire resistant paint for wood. Wooden surfaces and structures, such as lumber and engineered wood products, can be protected from fire by using coatings. Essentially these coatings can be divided into two groups; intumescent systems and fire retardant paint for wood. This article focuses on the latter, but the fire resistance rating system used is the same for both. In the United States most building codes rely on Fire Safety Code 101 established by the National Fire Protection Association (NFPA). The Fire Safety Code classifies materials (including fire rated paint for wood and other materials) from class A to E. A is the most resistant to fire based on flame spread rating, while E is least resistant. Each building type has its own requirements for fire rating. In the USA, the manufacturers of fire retardant paint for wood use this rating system to define the fire resistance of their wood fire protection products. For an overview of fireproof paint for wood and other substrates, see our fireproof coatings overview. The types of fire retardant paint for wood include flameproof paints, varnishes and wood preservatives. Even though the applications vary, they all result in a fire protection paint for wood based on similar technologies. 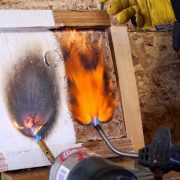 When fire rated paint for wood becomes exposed to high temperatures, it either releases flame damping gas or starts to form a self extinguishing foam layer. Comparing a surface treated with fire retardant paint for wood with an untreated surface. Fire retardant paint for wood – Exists as industrial and DIY products. Applicable as interior or exterior fire retardant paint and contributes to the looks of the surface. Prevents flame spread by emitting gas or forming a foam layer. Fire retardant paint is available for class A, B and C fire rating. Flame resistant wood preservative – Predominantly industrial systems. Usually applied during wood processing (pre fab) to ensure that a surface as large as possible is covered. Usually emits flame damping gas. Class A fire rating is common; the penetrating fire retardant systems for wood offer the best and longest lasting protection. Fire resistant varnish – Industrial and consumer products, clear systems that retain the natural looks of the wooden surface. Usually class B, or lower fire rating. Note that fire retardant paint for wood and other flame retardant systems can be applied as an independent system or combined with an intumescent product to increase the level of protection. There are codes and standards dictating the treatment of wood which can be found at the National Fire Protection Association. The demand for fire retardant paint for wood is increasing and technology is improving meaning that there is an increasing number of fire protection products for wood as well as contractors to apply them. If you require fire resistant paint for wood, be sure to contact a specialist in those application; a specialist in application on steel cannot help you. Additionally, there are wood processing companies which apply fire retardant paint as a standard on their lumber resulting in Fire Retardant Treated Wood (FRTW). An example of such a company in the United States is Lonza Wood Protection. If you are looking to get in touch with a manufacturer, supplier or contractor of fire retardant paint for wood, contact us! We are happy to connect you with the most suitable products and services, as well as providing competitive quotes in cooperation with our coating partners. If you are considering applying fire rated paint for wood yourself, you might want to take a look at the available products. Note that fire retardant wood preservatives often require specialist application. The industrial fire retardant paint for wood manufacturers include Sherwin Williams (Sayerlack), Teknos and AkzoNobel.